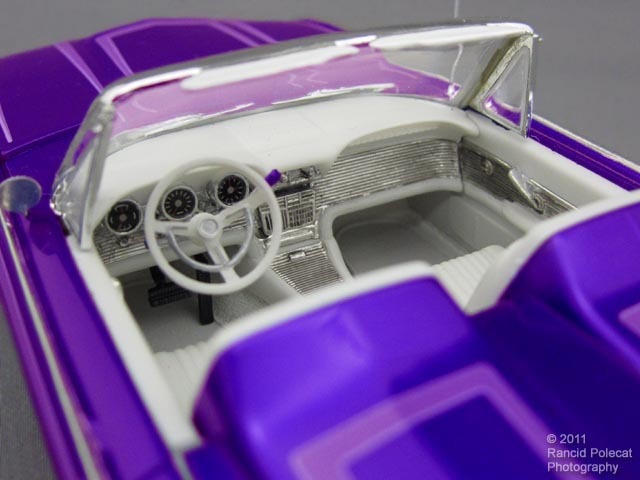 To make the most effective use of the kit-supplied gauge decals, Cruz chiseled off the molded digits and needles from the dash and smoothed the guage faces. The carpeting texture is provided by white embossing powder. Cruz added scratchbuilt floor mats in a slightly different shade of white. The seats are coated with Tamiya Insignia White paint and all the metal trim trim was given a black wash and lightly sanded with 6000 grit sand paper.